Damage to Mosque in Darya. Copyright: Syrian Youth News Facebook Group. 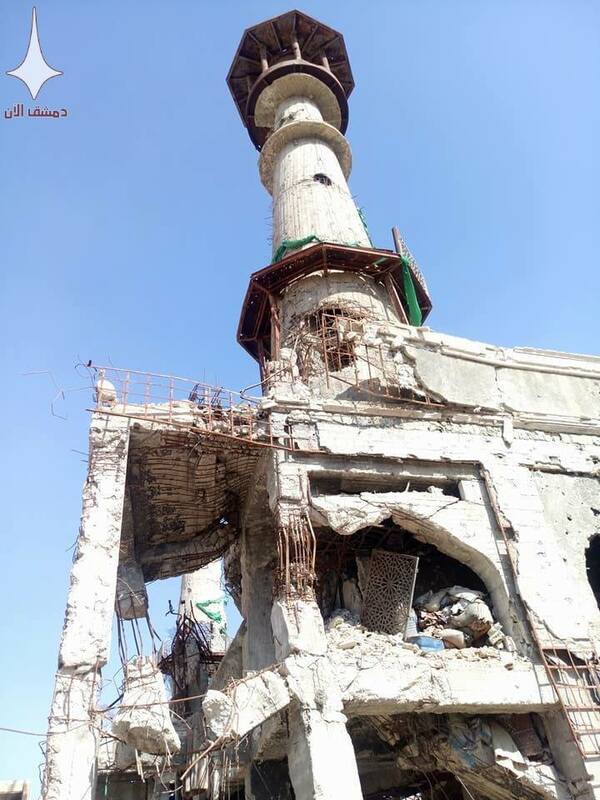 Photos from Syrian Youth News Facebook group appear to show mosque damage in . The DGAM have released a preliminary report on a fire in Juwaniyah in Old Damascus here. Idlib Antiquities Centre have released this video of someone shooting a wall in Deir Sunbel until it collapses here. The video is also shared by the Association for the Protection of Syrian Archaeology. They have also released an analysis of the damage here and here. A new cookbook examines Syrian history, culture and culinary heritage, featuring recipes from refugees. Read more on the Vancouver Sun website here. In Cairo, Egyptians are loving traditional Syrian recipes prepared by refugees according to Al-Monitor. The Lattakia Culture Festival recently occurred in Dar al Assad, and featured art exhibitions, shows, concerts, and workshops. Read more on the Syria Times website here. A number of heartfelt tributes have been published commending the work of the former director General of Syria’s Antiquities and Museums, Dr Mamoun Abdulkarim. These include ICOMOS and UNESCO, amongst others. With support from the government, local citizens are restoring St. Thecla’s monastery and Mark Sarkis in Maaloula. Read more on the Centre for Religious Pluralism website here. The National Museum of Damascus is now displaying the restored 2,000-year-old Lion of Al-Lat statue. Restoration was done by the General Directorate of Antiquities and Museums, UNESCO, and other international experts within the framework of a strategic plan to restore all ancient artefacts and preserve the Syrian civilisation and heritage. Read more on the SANA website here, Reuters here, and on Archaeology in Syria here. Ismail reports that the Aga Khan want to rebuild Aleppo’s Great Mosque. ATPA report the complete restoration of Tell Beydar, in Al-Jazira, finishing 12/10/17, here. There are a number of other photos of the work on their website and Facebook feed. They continue to meet to discuss how to protect archaeological sites (examples here and here, and an example of their work at Tell Mozan here). They have released a report about the protection of Idlib Museum here. The World Monuments Fund publishes the 2018 World Monuments Watch list, which includes the Souk of Aleppo. Read more on the WMF website here. Russia’s State Hermitage Museum and UNESCO have agreed to cooperate protecting cultural items in conflict zones, with special focus on sites in Syria. Learn more about this effort here. Ettijahat have announced the researchers accepted under the Fifth Edition of Research: To Strengthen Culture of Knowledge, which include Mostafa Alskaf, who will be looking at Institutional Response to Management of Threats Posed to the Syrian Material Cultural Heritage. His report is due out next year. There are also a large variety of research topics on intangible heritage. Read more here. Audrey Azoulay has been nominated as the next Director General of UNESCO as Irina Bokova comes to the end of her term. Azoulay must be confirmed by the UNESCO General Assembly in November. Read more on UNESCO’s blog here. The USA is to quit UNESCO (more here), as is Israel (more here). The Art and Antiques Squad of the New Scotland Yard, a specialised police responsible for the investigation of art and heritage crime in London, will continue after a temporary deactivation. Read more on the Art Crime Blogspot here. The ARCA blog writes about the international trafficking of looted antiquities and where the largest hoards are. The Security Council unanimously adopted Resolution 2379, requesting “Creation of Independent Team to Help in Holding ISIL (Da’esh) Accountable for Its Actions in Iraq”. UNITAR reports on new technologies that use virtual and augmented reality to help the humanitarian and development communities. Heritage Daily writes about how stories related to terrorism, ISIS, archaeology and cultural heritage are becoming more popular entertainment. Christina Fossa, U.S. Department of State: Virtual Student Federal Service intern for the Smithsonian Cultural Rescue Initiative, writes about her research about Syrian Cultural Heritage sites on the Conflict Culture website. Egypt Today provides an overview of some of the damage to Syria’s cultural sites since 2011.